Everyone says education is important, but how does it stack up in the face of other major national priorities, and are we getting as much out of our educational system as other countries? Federal, state and local governments spend a lot of money every year on education — more than a trillion bucks, in fact. 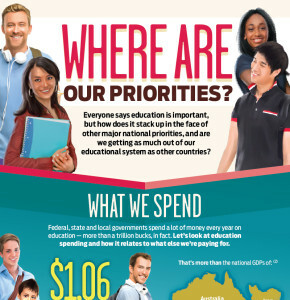 Let’s look at education spending and how it relates to what else we’re paying for. We spend a lot, sure, but we also have a lot of money. How does our spending stack up with other priorities? What about when you take into account what we produce as a nation? How does the 5.4% of GDP that we spend on education compare with what other countries spend? We’ve seen how much taxpayers spend on education. So what do we get out of it? Find out how the U.S. stacks up when it comes to educational outcomes. The U.S. educational system may not produce the best outcomes, particularly relative to how much is spent, but education is still perhaps the single best way to escape from poverty and better your lot in life.